You might hear a lot about B-complexes and how they can be used to up your energy levels and get an extra edge. And when people talk about those B-complexes, they might often mention riboflavin. But what exactly is riboflavin, and who should take it? Riboflavin is an affordable, easy-to-take supplement with a lot of research behind it. And most importantly, it’s one of the safest supplements you can take, even at high doses. Any healthy adult looking for a clean boost of energy should consider using it as a supplement, along with other B-vitamins. Riboflavin, also known as Vitamin B2, is one of the major B vitamins and is crucial for energy metabolism in the human body. It helps your cells grow and function normally, so it’s important in pretty much every major tissue throughout the body. It is an essential nutrient that should be included in every diet (x). Riboflavin works alongside two other molecules — flavin mononucleotide (FMN) and flavin adenine dinucleotide (FAD) (x). FMN and FAD are co-enzymes, and they help riboflavin metabolize a wide range of molecules to give you energy. If you don’t have enough riboflavin in your body, you won’t be able to break down all of the carbs, fats and proteins in your diet, which will leave you without the energy you need. It also means that your body can’t heal as well and won’t build muscle as quickly after workouts (x). Riboflavin is present in many of the foods that you probably eat fairly regularly. Foods rich in riboflavin include eggs, meats, nuts and many different green vegetables. 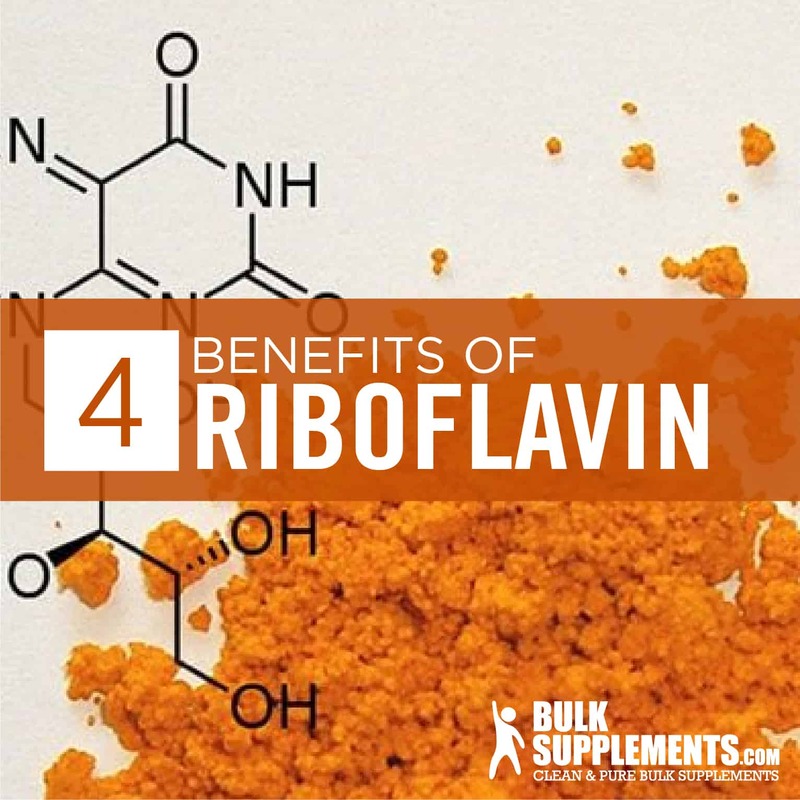 But how much riboflavin you get can vary greatly, even if you eat a consistent and healthy diet. And since riboflavin has to be replenished every day, it’s important that you have a consistent source of it so that your body’s energy metabolism functions properly. Riboflavin is often taken with other B-vitamins such as B6 and B12 to increase energy levels. This combination works together to metabolize food and give your body clean, long-lasting fuel. Riboflavin supplementation is beneficial for a lot of different people, as it can help treat a variety of medical conditions. Plus, it has an excellent safety profile with essentially no severe side effects, even at high doses. Here, we’ll discuss some of the main medical reasons why you might consider supplementing with riboflavin, as well as some of the other reasons you should use it, even if you are healthy. Riboflavin is key to maintaining energy levels in the body, keeping your immune system on guard and healing and rebuilding tissue from day-to-day wear and tear. But you may not always get enough of it through your diet. In some cases, this can lead to a condition called riboflavin deficiency. This condition can put a serious dent in your energy levels and put you at long-term risk of liver and neurological damage (x). Riboflavin deficiency also causes a breakdown of the skin around your mouth and can cause tongue swelling and a sore throat. It also has an impact on the mucous membranes in and around the mouth (x). Those with riboflavin deficiency have issues absorbing iron, which is crucial to binding oxygen to red blood cells and delivering it to cells throughout your body. If you don’t get enough iron, this leads to anemia. The main symptoms of anemia include fatigue, muscle weakness, shortness of breath and difficulty concentrating (x). If you do not address a riboflavin deficiency, it can lead to lifelong health issues, severely affecting your liver and causing nervous system degeneration (x). Fortunately, the treatment for the condition is straightforward. Oral riboflavin is given until the patient’s level are back within the normal range. It can take a while to get fully back to normal, but there aren’t often complications. By supplementing with riboflavin, iron levels in hemoglobin increase due to better binding. This means that more oxygen is transported around your body, giving your cells the fuel they need to function while letting your metabolism get back to normal. Your energy levels will rise, and you won’t have any more muscle weakness. It is important to know that even relatively mild riboflavin deficiency can still cause anemia, along with all of the negative symptoms that come with it. Fully recovering from anemia can take time, even if you catch it early. That’s why it’s important that you always have enough riboflavin in your diet. If you don’t have a varied diet, or you have one that’s high on processed foods, you could be at risk of developing riboflavin deficiency. Alcoholics have an increased risk of developing riboflavin deficiency. They have issues absorbing the vitamin and difficulty using what is absorbed. They also tend to have less varied diets, putting them at risk (x). The elderly are also more at risk of developing riboflavin deficiency, as well as young children, although researchers don’t know exactly why (x). Cataracts are a medical condition where there is clouding of the lens in the eyes. This can cause severe issues with vision and even lead to blindness. It is a common condition as people age and is usually treated with surgery. Research has shown that those with a more riboflavin-rich diet seem to be at a lower risk of developing cataracts (x). Researchers still do not know the exact role that riboflavin plays in cataracts and if higher riboflavin actually has a direct role in lowering risk for cataracts and other eye problems. Regardless, it’s a good idea to make sure you keep your riboflavin levels up to protect your eyes. This condition comes from elevated levels of a molecule called homocysteine in the blood. It leads to a much higher risk of developing cardiac issues, neuropsychiatric illness, and can negatively impact bone health (x). Riboflavin interacts with other molecules to help lower blood plasma levels of homocysteine and get them back to normal range. It does this alongside other B-vitamins such as B-12. Research shows it may help manage hyperhomocysteinemia, though it does not cure it (x). Riboflavin is used as a general supplement to boost energy levels, often as part of a B-vitamin complex. It is also an immune system booster. It can even improve skin and nail health while acting as an athletic performance booster (x). Riboflavin is also common in treatment for migraine headaches. Researchers believe that by helping cells function more efficiently, riboflavin reduces many of the symptoms commonly found with migraines. The dose used here, however, is significantly higher than that for any other use (x). Some doctors also use riboflavin as a secondary treatment for people with Parkinson’s, leading to improved motor capacity in some patients. Although it may be of some use, riboflavin only has a small positive impact and cannot stop the progression of the disease (x). Additionally, it is sometimes used in pregnant women to lower risk of developing preeclampsia. It is still unclear whether low riboflavin itself is a direct cause of preeclampsia (x). Probably the most common use is for energy levels, taken alongside other B-vitamins. This combination has a wide range of benefits, even for otherwise healthy individuals. First and foremost, it can have a positive impact on energy levels and mood. This is done by improving energy metabolism in the body, meaning you have more fuel to get through the day. There is also some evidence that it can improve cognitive performance and reduce mental fatigue. It also may help reduce anxiety and help treat depression (x). B-vitamins seem to work well alongside antidepressants, enhancing their therapeutic effect (x). In addition, it can reduce stress levels. Riboflavin is water-soluble, so excess amounts of it are shed in your urine and are not stored in the body. This makes it a fairly safe supplement, although there can be some side effects that you should be aware of if you are considering using it as a supplement. Too much riboflavin in your system may cause you to urinate more frequently. This is a fairly common side effect with riboflavin supplementation, and should not be cause for concern. If the problem persists after discontinuing use of riboflavin, consult a doctor (x). Riboflavin can also cause some gastrointestinal side effects, including diarrhea. Again, if the side effect remains after you have stopped supplementing with riboflavin, consult a doctor (x). In addition to making you urinate more, riboflavin can also cause discoloration of your urine. The urine often turns a yellow-orange color. This should not cause alarm, however, as this is a way for the body to shed the excess supply of riboflavin (x). 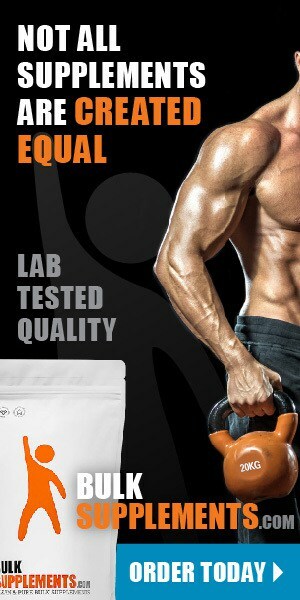 The dose that you will require will depend on your reasons for taking riboflavin as a supplement. If you are a healthy adult using it for energy or athletic performance, a dose around 1.3 mg per day should be enough, although you can experiment with different doses to find one that works for you (x). If you are considering taking a high dose, speak with your doctor. In most cases, however, even high doses of riboflavin are safe. If you are riboflavin deficient, you will need a higher dose and should consult with your doctor on what is best. And the dose will depend on whether you’re trying to prevent riboflavin deficiency or treat an already existing case of it, as well as the severity of the deficiency. Standard doses range from 5-30 mg per day (x). For headaches, a significantly higher dose is used, often from 300 to 500 mg per day. This dose is many times higher than that used for other health reasons, so you should speak with your doctor if you are considering using this as a treatment for your headaches (x). Many people will get enough riboflavin in their diets. After all, foods high in riboflavin include eggs, milk, meats, nuts, and leafy greens. These foods are commonly available, so you may wonder why you should consider supplementing with riboflavin. The main reason? Food-based sources of the vitamin are not always consistent, meaning doses will vary. If you supplement with riboflavin, you can ensure that your body is getting the appropriate levels of the vitamin and not have to monitor your diet to make sure you are consistently getting enough. And since it’s water soluble, there’s little risk from using riboflavin supplements aside from side effects like increased urination and discolored urine. It is a great vitamin for energy and can be an effective part of a supplement regime that keeps you going throughout the day — or give you more energy for workouts, keeping you from losing steam halfway through. However, if you do decide to take riboflavin, consider adding other B-vitamins. It is most effective as part of a B-complex, where all the vitamins work together to boost your metabolism and make the most of your food (x). Riboflavin is a key vitamin for your health and has an impact on nearly every system in the body. Riboflavin deficiency can lead to a whole host of health problems, from fatigue to cataracts. And even a mild case of riboflavin deficiency can lead to anemia, which can cause severe fatigue and muscle weakness. Supplementing is a great way of making sure you always have enough riboflavin, cutting out the guessing game of figuring out how much you are getting from your diet. Taken with other B-vitamins, it can provide an excellent and safe source of energy and should be considered by anyone looking for a natural boost.